Of all the famous English gardens, Sissinghurst is perhaps the most familiar because of one of the gardens of note it contains: the White Garden. This is just one of ten distinct garden “rooms,” each with a different feel, built around the remnants of a once-grand Elizabethan manor house. 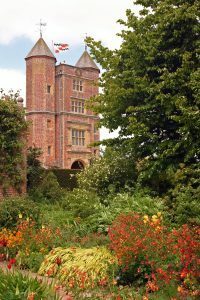 The gardens were created in the 1930’s by Vita Sackville-West and her husband Sir Harold Nicolson – he a diplomat turned reviewer, she a writer, poet and newspaper columnist – on this ancient site in the Weald of Kent southeast of London. The gardens are set off by a tall tower of pale pink brick which captivated Vita when she first saw Sissinghurst; she wrote some 20 books in the Tower room and it remained her refuge until her death at age 70. Side entrance to Priest’s House. The buildings were heavily damaged during this time, so at the end of the war many of them were demolished, leaving only the entrance range, the tower and a few of the outbuildings. Over the next 50 years the buildings were occupied by the poor who worked on the estate farm and nearby brickyard. When the large Victorian farmhouse was built in 1855, the old buildings were scarcely habitable. 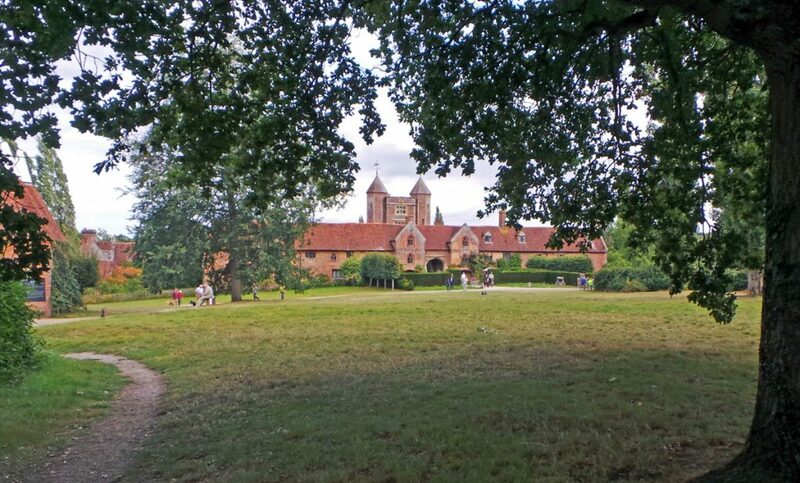 Sissinghurst Castle once again went up for sale in 1928. On a rainy day in April 1930 Vita Sackville-West came looking for an old house where she could make a new garden, fell in love with Sissinghurst Castle and she and her husband bought it, along with 400 acres of farmland. They made few changes to the remaining buildings, other than carrying out some careful restoration, but completely transformed the grounds. 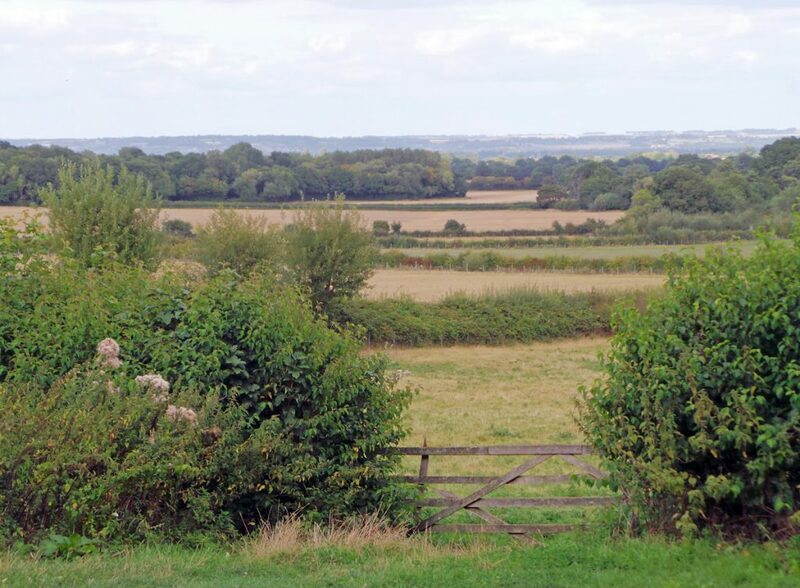 Old farm buildings and countryside beyond in spring. 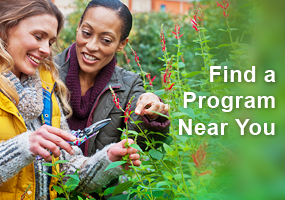 It took three years of thinking, planning, and cleaning up the piles of junk left behind by former occupants before they really started creating the gardens. During this time they discovered the moat wall of the medieval manor house and created a lake to the south by damming a stream that filled two marshy areas. Eventually English yew (Taxus baccata) hedges were planted, but it took many years for the slow-growing plants to get large enough to fit the intended design. Limited funds also constrained the development of the gardens to a certain extent. The Tower from the Cottage Garden. The design of the garden was partly determined by the existing buildings and walls, and the moat which provide a romantic backdrop to the plantings. Three new walls were added, as well as many hedges of yew, boxwood, rose and hornbeam, to divide the six acres into separate gardens, linked by vistas formed by gaps in the walls and hedges, from which smaller gardens open unexpectedly. Harold described his aim as ‘a combination of expectation and surprise.’ The succession of intimate enclosures makes Sissinghurst seem much larger than it really is. This garden is also rather unique in that, unlike most gardens that are located next to the owner’s home, these gardens were created within the ruins of a home. They lived amid the ruins as if it were still a manor house. Instead of living in the farmhouse (which they rented out), Vita and Harold had rooms in the South Cottage; the kitchen, dining room and boy’s rooms were in the Priest’s House; and the entry range’s stables were transformed into the Library, or family room, where a TV was installed in 1939. The garden next to the Priest’s House was used as a dining room whenever the weather permitted; the courtyard was their entry hall; and the tower was Vita’s private work space. “Profusion, even extravagance and exuberance within the confines of the utmost linear severity”. Sissinghurst is a sophisticated garden, with the plantings deliberately varied from one part to another. The formal herb garden and paved lime walk contrasts with the unmown orchard; the cottage garden boasts a profusion of flowers in hot colors, while the white garden eliminates all colors but white and green. Harold‘s taste leaned toward the classical, with its geometrical patterns and symmetrical arrangement of steps, paths, pots and statuary, while Vita preferred a more romantic approach. She filled the beds and enclosures he created with a profusion of plants that might spill onto or creep over the path – but the hedges were always neatly trimmed and plantings kept free of weeds with a mulch of spent hops. She disliked regimented rows of flowers and carefully grouped the plants according to color, texture and season. 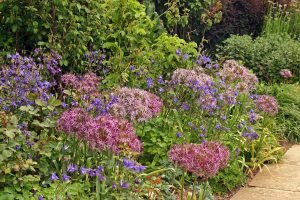 Alliums and columbines provide color in the Rose Garden in the spring. The garden was first opened to the public in 1938, while Vita and Harold were still living there. When Vita died in 1962, Harold and her two sons transferred ownership to the National Trust to preserve the garden (completed in April 1967). Now it is enjoyed every summer by thousands of visitors from around the world. The National Trust has tried to maintain Sissinghurst looking the way that it did when Vita lived there, but some flowers and trees have had to be removed or replaced due to age or disease; additional flowers were added to the rose garden (which was intended to be filled with roses during June but little else for the rest of the growing season) that bloom before and after the roses bloom, changing the feel of that garden; and grass and uneven paved paths were replaced with level stone paths and bushes were trimmed away from paths for the comfort and safety of visitors. As you walk in from the parking area you pass The Garden Shop and The Coffee Shop housed in what was old farm buildings. 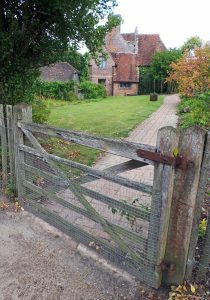 Then it’s on to get tickets at Visitor Reception and Information in the small building just before the big oast houses. Kent is famous for it’s oast houses – buildings traditionally used for drying hops, an essential ingredient for making beer. The buildings have a tilted white cowl on top for venting the steam and hot air that was used to dry the plants. Few are used for their original function; most have been converted into living spaces or storage. 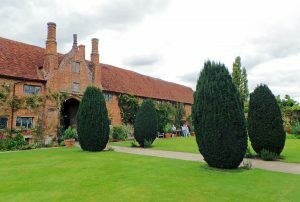 At Sissinghurst they now house an exhibition on the historical, personal and horticultural story of the estate and garden. The Plant Shop (L), Visitor Reception (C), and the oast houses converted to house exhibitions (R). The adjacent Elizabethan barn reflects the importance of the farm surrounding the castle and gardens, while the former granary is now a restaurant serving hungry visitors. The gift shop is in the old farm building next to the barn. The granary now houses the restaurant (L), the Elizabethan barn (C) and gift shop in building by barn (R). The entrance is the largest and oldest part of the surviving building dating from about 1490. It was originally the service range, with stables on one side of the archway and lodging for servants on the the other, and was one of the first big houses in Kent to be built of brick instead of stone and wood. When Vita and Harold bought the property, the archway was bricked up on both sides. One of their first improvements was to open it up. There are two strange alcoves, shaped like fireplaces flanking the entrance archway. Walking toward the entrance to the gardens at Sissinghurt (L), the tower and service range (C) and the entrance archway through the service range. Inside the courtyard, the bed along the north wall is planted with nothing but purple-flowering plants. This purple border was probably a deliberate response to Gertrude Jekyll’s comment that purple was a difficult color in gardens and should be used sparingly. Vita combined numerous shades of magenta, mauve, lavender, and purple to create a rich, monochromatic tapestry. This border looks best on a cloudy day, as the flowers are a bit dull in the sunshine, but imagining it as an old tapestry hanging against the wall of a grand hall, makes it very effective. The purple border is the showpiece of the courtyard, but Vita loved roses and clematis, so they were used here, too. Red (‘Allen Chandler’) and pale pink (‘Meg’) roses climb up the old brick walls around the archway and toward the dormer windows, and clematis and other vines cover other parts of the house and walls. The purple border in the front courtyard from the tower (L), in spring (C) and in late summer (R). A number of stone sinks dating from the 19 century were salvaged from the junk left on the property and used to grow alpine plants. Other colors sneak into the beds around the rest of the perimeter of the lawn. Some plants we would consider weeds are included in this garden, including the purple form of Dame’s Rocket (Hesperis matronalis) and purple loosestrife (Lythrum salicaria) that blooms later in the season. Dame’s rocket in the purple border (L), Euphorbia myrsinities growing in a stone sink (C), and Joe-pye weed (R). Irish yews along the path in the entry courtyard. The entry courtyard was difficult to design because the arches of the entry range and tower are not directly opposite each other; the building angles inward, so the north and south walls are different lengths (see the map, above); and the two buildings are at different levels. Instead of paving the entire courtyard (which they couldn’t afford), the ground was graded and a path installed between the broad lawn and beds along the perimeter. The paved path, flanked by topiary Irish yew trees (which Vita preferred left as shaggy pillars), leads to the tower. The tall tower of pale pink brick at Sissinghurst Castle Garden. 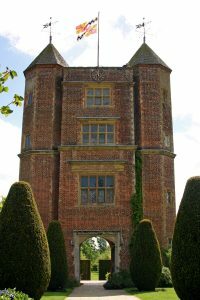 The tower was what captivated Vita when she first saw Sissinghurst and is where she spent considerable time reading and writing books, including her best novel All Passion Spent, the life of her grandmother Pepita, and gardening articles which she contributed weekly to the Observer for 16 years. The four-story Elizabethan tower with its two octagonal turrets is a focal point of the gardens. A wooden spiral staircase leads up from the archway at the base, past the cluttered room where Vita wrote. The Tower Lawn, also known as the Lower Courtyard, is the most simple of Sissinghurst’s garden rooms. Although this area does have trees and flowers, the lawn is the dominant feature. A visitor first sees a glimpse of this lawn looking through the tower’s archway from the Front Courtyard. This garden is an important part of the overall design, serving as the hub for the main axes, and providing a “rest” from the other intensely planted areas. This is the open area from which visitors can appreciate the lines of the garden. 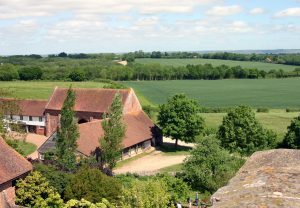 At the top of the tower, the view includes not only the 12 acres of garden, but also the Weald up to the North Downs 12 miles away and the woods, lakes and oast-houses of the Sissinghurst estate. This is the only place to see the garden in its entirety. Looking down from the flat roof of the tower between the turrets, the layout of the gardens is quite clear. The Tower Lawn (L), looking up from the lawn at the Tower (C), and view of the front courtyard and Rose Garden from the top of the Tower. The long yew walk is nothing more than two narrow green hedges enclosing the paved pathway, but when viewed from the opening from the Rose Garden or White Garden, a sense of distance is created in a fairly confined space. The hedges also separate the Tower Lawn and Orchard and are one of two central axes of the gardens. The yews weren’t spaced far enough apart to allow for their growth when they got older, so the path isn’t wide enough for two people to walk side by side on the path – one of the few flaws in the gardens’ design. The Yew Walk, along the back of the Tower lawn with the South Cottage beyond (L), the sheared yew hedges from the tower (C), and as seen from the Rose Garden (R). Roses were one of Vita’s favorite flowers. Roses were one of Vita’s favorite flowers, and they are an important part of all the gardens. 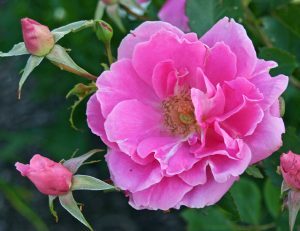 The Rose Garden is richly planted with old-fashioned species which are at their peak for essentially only the month of June. The Rose Garden is in the walled space that was once the garden of the Tudor manor. The yew hedges forming the Rondel – enclosing a round patch of grass in the middle and with gaps in each quadrant leading to formal beds outlined in boxwood – were planted in 1932. Like the courtyard, the Rose Garden is not a perfect rectangle, so dividing the space with the Rondel obscures the imperfection. It was offset from the absolute center so it would line up with a doorway of the old Tudor manor, making the western part of this garden larger than the eastern part. The tall hedges block views from inside the Rondel into the Rose Garden, instead directing attention to a focal point at the end of each walk. The curved wall at the east end reflects mimics the design of the best Italian gardens of the 16th and 17th centuries. By late summer the wall is covered with purple-flowered clematis. At one time 12 old crabapple trees lined the central walkway, but they were removed in the 1960’s. They were later replaced with serviceberry (Amalanchier) trees. The east end of the Rose Garden from the Tower (L), the Rondel from the Tower (LC), inside the Rondel (RC), and the focal point of the curved wall at the east end (R). Vita’s original intent was to have mainly a shrub rose border, not an herbaceous border. Peonies and bearded iris were integrated with the old roses to bloom earlier, and clematis, a few lilies and Japanese anemones flowered later, but she generally wasn’t in residence in late summer, so had no need to have this garden colorful all summer. After taking responsibility for the garden, the National Trust added many more perennials so the garden would be attractive in late summer. Another change was to pave the mown grass paths through the Rose Garden since the grass couldn’t stand up to the heavy traffic of visitors; Vita might have had this done earlier had they been able to afford to. Paved paths and many other shrubs and perennials were added (L), including lilac and bearded iris (LC), blue agapanthus and white anemones (RC), and foxglove, iris and peonies along with this yellow rose (R). This part of the garden was designed, planted and maintained by Harold himself. It was intended to be a classical garden after the Italian model, with statues at each end and Tuscan pots at intervals along the way. The odd angle, relative to the other gardens, was necessary because of the 6 long rows of hazelnut (filbert) trees in the Nuttery, probably planted in the late 19th century, that the design had to fit around. The axis of the Lime Walk lines up with the main walk of the Nuttery, to connect to the Rose Garden. The Lime Walk is at its peak in spring when spring-flowering bulbs are in bloom, before the pleached limes (Tilia sp., with the common name of linden in North America) leaf out. (The trunks are kept free of branches to about 7 feet, then three rows of branches are trained on three horizontal wires, creating, in effect, a narrow hedge on stilts.) The trees are clipped each year to maintain their shape. In the summer impatiens planted in the terracotta pots, imported from Siena, Italy in 1965, provide some color, but the planting of bulbs is too dense to accommodate any other plants in the ground. Hornbeam hedges separate this area from the Rose Garden and open pastures to the south. A statute of a Bacchante terminates both the Lime Walk’s vista and the vista through the Rose Garden’s Rondel. Stone has replaced the concrete pavers Harold was forced to use. Pleached linden trees line the Lime Walk (L), which is pruned in every summer to maintain their shape (C). A statue terminates the Walk’s vista (R). The Cottage Garden was intended to be a private family garden, next to the South Cottage where Vita and Harold lived. It was the first garden they planted; on the day they bought Sissinghurst, they planted a white rose, ‘Madame Alfred Carrière’, against the cottage wall. It still survives, climbing up the building, above the door and windows. In the Cottage Garden, looking back at the Tower (L), the South Cottage with the white rose, ‘Madame Alfred Carrière’ (not in bloom) on the wall (LC), and colorful flowers in front of the Cottage in late summer (RC and R). This garden has a simple plan of narrow, crossing paths, with Irish yews marking the corners of the intersection. An antique copper boiler is the focal point of the intersection of the main paths. Before Sissinghurst was taken over by the National Trust, the brick and stone paths had creeping thyme and other self-sown flowers growing in them, but the number of visitors dictated otherwise and now the paths are set in concrete. This garden is representative of cottage gardens everywhere in England, but the color scheme is completely different. Traditional cottage gardens tended to have plants blooming in shades of lavender, pink and white, mainly because that’s all that was available before the 19th century. Vita used the latest hybrids and new plant introductions in this garden, and restricted her choices to hot colors: yellows, reds and oranges. The gardeners continue to add new plants, all in keeping with this scheme. Annuals and perennials blooming in hot colors fill the Cottage Garden from spring to fall: orange wallflower, red and yellow columbine and yellow iris (L); yellow iris, orange geum, bicolor columbine, yellow yarrow (LC and C); red Japanese blood grass and dahlias, orange tithonia, yellow ‘Tara’ ginger (RC); red hot poker and red dahlias (R). The Moat Walk is the name given to the sunken lawn that leads from the Cottage Garden to the moat. This is the third arm of the moat that once surrounded the medieval manorhouse on three sides. The northern and eastern arms are still filled with water, but it proved too difficult to bring water back into this southern one, so they settled for lawn instead. White wisteria (Wisteria floribunda ‘Alba’) drips over the walls in a cascade of blossom in June, making this a favorite of visitors at this time. Corydalis lutea and other plants grow in the cracks of the ancient wall, but none of the plants are allowed to overtake this medieval relic. The Moat Walk is separated from the Nuttery by a bank of azaleas. A brick landing near the Cottage Garden at the top of the Moat Walk (L) leads to the Moat Walk (LC) which has blooming azaleas (RC) and white wisteria (R) in spring. At the end of the Moat Walk, on the opposite bank, stands a statue of Dionysus as the focal point from the terrace at the opposite end of the walk, and coincidentally, from the tower steps. Corydalis grows in the brick walls (L). Perennials line the Moat Walk (C) that leads to the focal point of a statue of Dionysus on the opposite bank of the moat (R). The small, rectangular formal herb garden with its medicinal and aromatic plants is enclosed by buttressed yews. 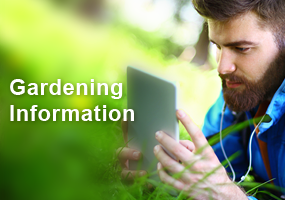 A mixture of over a hundred varieties of herbs and useful flowers makes the Herb Garden colorful as well as aromatic. The paths were originally creeping thyme over concrete slabs and grass, but had to be replaced with brick and stone because of damage from foot traffic. The shallow marble bowl – filled with Sempervivums – in the middle was bought by Vita and Harold in Istanbul, where it stood on its tripod of little lions in their sitting room when they lived there for a year. It sits on an old millstone on a slightly raised bed of bricks fanning out from the center. The “chamomile seat” was created by their chauffeur, Jack Cooper, from pieces of stone from the ruins of Sissinghurst Castle, something that was very popular in medieval gardens. The Herb Garden in spring (L). The marble bowl filled with Sempervivums is supported by stone lions sitting on an old millstone (C), while the “chamomile seat” is along one of the walls of yews (R). The orchard sits between the two water-filled arms of the moat in the place where the old medieval manorhouse once stood. In the spring the area is filled with white and yellow daffodils, so the grass is not mowed until much later in the season, after the bulb foliage has died down. This gives a rather wild, unkempt look to the place for while. Mown paths through this temporary meadow lead to the small, octagonal gazebo at the junction of the two arms of the moat. The gazebo was build in 1969 by Nigel and Benedict Nicolson as a memorial to their father, Harold, and was used as a private summer office with windows looking out onto the countryside rather than the garden. The rustic Boathouse is at the corner of the orchard nearest the White Garden. The orchard from the Tower (L), autumn crocus in bloom under apple trees (LC). the unmown meadow in spring with the gazebo beyond (RC), the Boathouse is at one corner with the gazebo at the far end (R). In 1987 the remaining old fruit trees that were probably planted in the first half of the 19th century were blown down in a storm. The trees – mainly apples and pears – have been gradually replaced (so they won’t all be the same age and end up dying at the same time). This building was restored to house the kitchen and dining room and the gardens around it were some of the first to be created. The “Delos”, to the south of the house, which was laid out in 1935 and planted with mainly earth tones, was named after the Greek altars that were once spaced along its path. Harold came up with the idea for this garden when he visited Delos, a Greek Island in the Aegean Sea in 1935. The area to the east was replanted in 1950 as the famous White Garden. Brick steps lead into the Delos from the Courtyard Garden (L), a shady, informal garden (LC) adjacent to the Priest’s House (RC and C). This garden is probably the most famous of the separate gardens at Sissinghurst. It was started in 1950 by replanting the garden to the east of the Priest’s House, retaining the original layout but fusing a color scheme of silver and white: focusing on plants with gray or white foliage and flowers of mainly white, but with touches of yellow. It is unclear what inspired Vita to create this monochromatic garden. Through her writings we know she had been thinking about creating a white garden for at least a decade. Although other white gardens in England (such as the phlox garden at Hidcote) predated this one, they did not seem to have an influence on the development of the White Garden at Sissinghurst. Some speculate that she was inspired by descriptions of white gardens from hundreds of years earlier in Moghul India. The White Garden from the Tower, with the Priest’s house at left and enclosed by yew hedges (L). 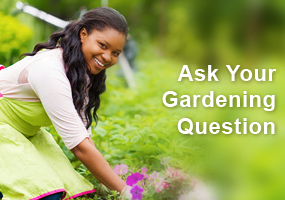 The garden has only plants with white flowers and silver foliage (C). A path through the White Garden with the Tower beyond (R). This garden is lovely through the seasons, but it was designed to be at its best in early July and especially in the evenings or when illuminated by a full moon, since this garden was always used as an outdoor dining room. In one corner there is a dining table shaded by a rose arbor supported by broken columns (dubbed the “Erectheum”), where the family would eat whenever the weather allowed. There is little ornamentation in this garden, with only the statue under a weeping pear and a large gray Chinese jar, purchased by Harold in Egypt. The wrought iron arbor over the jar in the center of the intersection of the main paths replaced almond trees that eventually died and were removed in 1970. The most vigorous of the climbing roses (Rosa mulliganii) that had rambled through the trees was left to be trained over, but not completely obscure, the arches of the arbor. The central wrought iron arbor (L) has climbing roses growing over it (C). The orchard can be seen through an opening in the yew hedge (R). Vita wrote a description of her plantings in the White Garden in her a regular gardening column in the Observer for July 5, 1955: “There is a white underplanting of various artemisias, including the old aromatic Southernwood; the silvery Cineraria maritima, the grey santolina or Cotton Lavender; and the creeping Achillea ageratifolia. Dozens of the white Regale lily (grown from seed) come up through these. There are white delphiniums of the Pacific strain; white eremurus; white foxgloves in a shady place on the north side of a wall; the foam of gypsophila; the white shrubby Hydrangea grandiflora; white cistus; white tree peonies; Buddleia nivea; white campanulas and the white form of Platycodon mariesii, the Chinese bellflower. There is a group of giant Arabian thistle, pure silver, 8 feet high. Two little sea buckthorns, the grey willow-leaved Pyrus salicifolia sheltered the grey leaden statue of a Vestal Virgin. Down the central path goes an avenue of white climbing roses, trailing up old almond trees. Later on there will be white Japanese anemones and some white dahlias….” These plantings have remained essentially unchanged, although the gardeners have introduced a few new plants. White lupine (L), columbine (LC), cosmos and Arabian thistle (C), roses (RC), and phlox (R) in the White Garden.